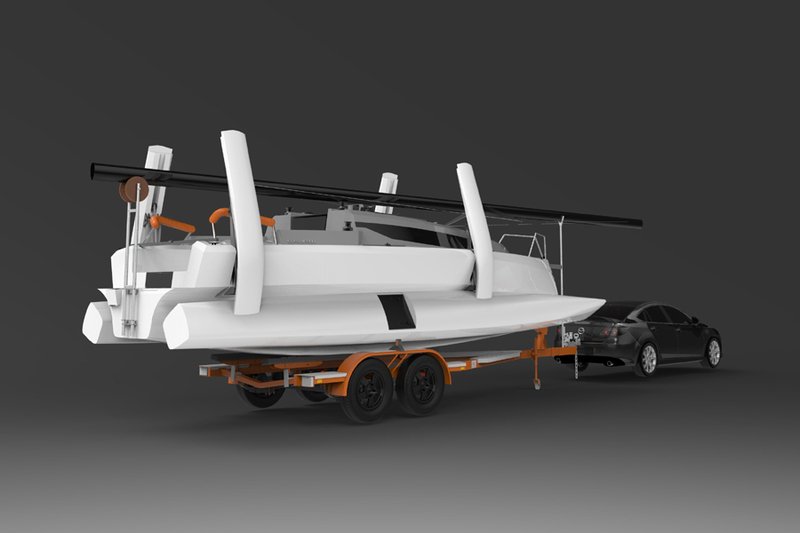 Fast, fun and stable the all new Corsair 880 trimaran has been designed and built from the ground up by Corsair Marine. Inspired by the very popular and hall of fame F27. She is completely safe and comfortable and perfect for people of all skill levels. Designed with comfort in mind, the Corsair 880 is fully kitted out for cruising or weekends away. Electric lighting, refrigeration, manual or electric toilet, and even air conditioning is available. Furthermore, a small generator complements a lightweight air conditioning or heating unit and providing comfortable electrical independence when cruising in hot or cold climates. In true Corsair fashion, that generator and air conditioner are removable to reduce excess weight when racing or reduce trailer weight when on the road. This is where the 880 is the revolutionary boat it promises – all of that comes in a folding, trailerable package well below the trailering weight limit of most passenger cars. In other words, drive to your ideal cruising or racing destination and spend more time on the water. The all new Corsair 880 brings effortlessly fast performance sailing while being completely safe and comfortable for people of all skill levels. First of all she features a protected cockpit, high-aspect hulls and foils and a huge unfolded beam. Furthermore, she has full boat systems for cruising comfort including electric lighting, refrigeration and an enclosed head. Finally and probably most noteworthy she is fully trailerable. Well below the trailerable weight limit for most passenger cars, also quick and easy to pack away on and take out of the water. Please fill in your details below and we will get back to you shortly with a detailed info pack on the Corsair 880, including a brochure, specification sheet and pricing information.